I like it, nice one matey! Should probably post it to FSB in case this would spring up the real values for the subs switch. Nice, so, this woud be like the distortion part of the Box of of rock? 1:1 with added switches for more gain and thinner low frequencies. With gain switch "off" and subs switch at "3", it should be exactly the dirt side of BOR. How about a Box of Rock with the switches? I would love to see a BoR with the switch options as well! Or would it be as simple as adding a Super Hard On? my first comment on your blog, so first of all: Thanks for all this work you put in here, already took lots of inspiration! Here's something about the tone stack I found at a German forum (musikding). One guy wasn't happy about the sub switches either (his source too was fsb). So, he started experimenting with the 470k resistor and 470pf capacitor. (there's only one of each, you find them in the middle of the vero). They couple the first and second gain stage, if you have a look at the BOR schematic, but I'm not a 100% sure about what the resistor does actually, as I'm still learning. - value higher than 470k makes it less "muddy"
0k - comes closer to a fuzz, just a little more dynamic: sounds a lot like "queens of the stone age"
Thanks for this info. One could replace the 470K with a 1M lin pot :) Did he have any input on the subs switchx values? I would love to see a layout with these options as switchable. I *think* a on off on could do it. Am I right? @mirosol: No, he didn't have more info on the sub switch values other than what people where talking about in the fsb-thread. I'm also thinking of making the 470k a 1M pot, but wouldn't it be better to place a logarithmic one there? If in doubt over taper, I'd always go linear first, then you can change if needed. Since it doesn't have anything to do with volume, I think linear is probably the way to go then. Thanks for the advice, Dave! The Boomstick schematic doesn't use the 3-way Subs switch and has a (possibly) incorrect value for C7. 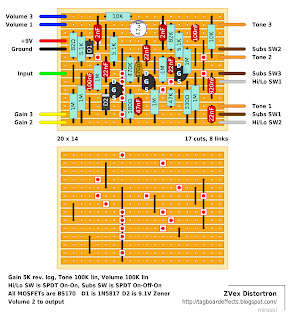 Hi, i want to build this Pedal, but can't find any 2nF cap on Tayda. is it possible to use a 2.2nF cap without any change in the result? 2.2 would be fine, I doubt you'd notice any difference. I would describe the sound as a "cleaner" distortion compared to something like a Rat. Very crisp and bright. Tonnes of low end, even on the lowest sub switch setting. Does anyone know the differences between the Distortron and the Basstortion ? I included the mod someone here mentioned replacing the 470K resistor with a 1M pot, and that really allows a lot of extra tweaking. Yes Hi/Lo2 would be connected to the center lug, and hi/lo 1 connect to one of the lugs next to it. It's not connected. If you want, you can chain lug 2 with lug 1, but that won't affect the operation in any way. Works like a charm! It's too late in MKD to play loud and nice, soon I'll post pics;) Thanks a lot all of ya! Hi, trying to make a Double Rock which I believe is two of these cascaded. However it doesn't have the hi/lo bit but has a switch to turn each one into an SHO. Any idea how to do this?? Q1 in this is basically a slightly modified Super Hard On so a switch that bypassed the rest of the circuit would do exactly what you describe. I'd at least want to see a high resolution gut shot before doing a layout though so I can see any other differences which Zack is bound to have made, I wouldn't ever want to guess at a layout without having something tangible to go off. Cheers - I think you are right. What mods are needed to make this a basstortion? My build is working otherwise perfectly, but the SUBS-switch isn´t doing anything... Any suggestions? By the way, this is one of the better sounding distortion-units. I just finished mine. I went with a vertical layout and did the 'crackle not okay' mod on mine, and it sounds awesome. John, where do you order your mini switches? They look nicer than the ones I've ordered from Tayda and other Ebay sellers. I get them from smallbear. Did you replace the SHO in front of it with a "Crackle not ok" SHO? I have build several Bor's and Distortrons but they all sound harsh to me. Earpearcing high frequenties when you build it as above or as in the schematic that's going round. Why is nobody complaining about this or are my ears high sensitive? Complete useless in this way, and it is not what I hear on You Tube. Maybe the schematic is not complete and there must be a cap of 470 pF between the drain and gate of the first gainstage mosfet. Try it and be suprised. I'm a strat Fender Deluxe guy and needed to fake some Ramones songs for a covers night. I built this and it nails it. I just want to say I've been building pedals for a couple of years now and learned most of what I needed to know from here having started with a bitsbox Hearthrob kit. There's something relaxing about making pedals and it's great to have stompboxes that you couldn't otherwise afford but the opportunities to explore new guitar sounds is the real joy. Just built this and ...HOLY CRAP... this thing has some balls! I love it. Only change I made was subbing a 10K Rev Log for the gain as I found that, even on the LO gain setting, the bigger pot gave me more control range. At the bottom (10K) I can get a nice crunch, while the top (0K) is super thick fuzz-like. hey! 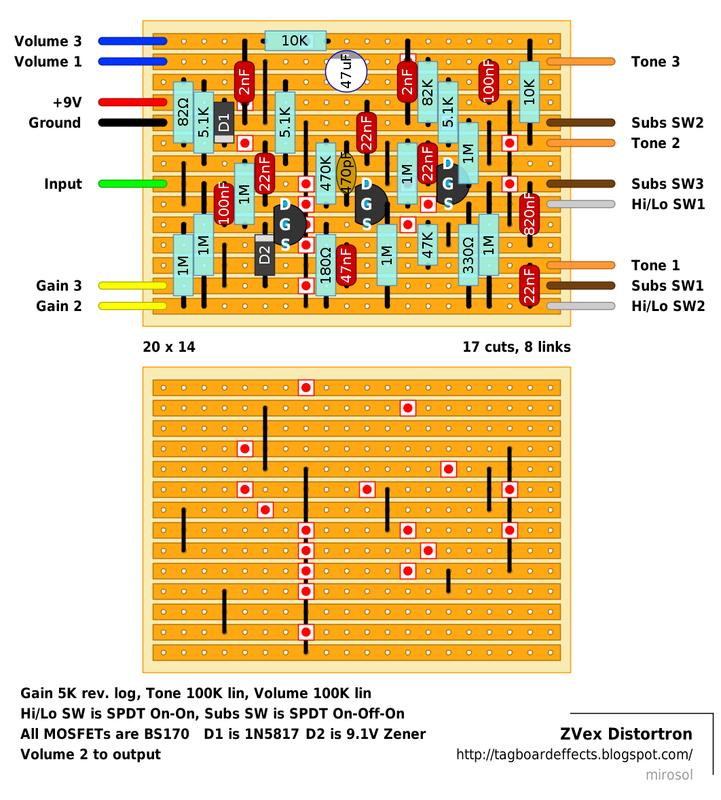 i'm looking to build a BoR/distortron, but i'm struggling to source a c5k pot. would a b5k pot be a fair replacement for it? Sweep will work, but won't be as usable as with C-taper. So normally B10K + 10K resistor would do the job. However. Altering the taper for a pot that's wired as a rheostat isn't as simple. Anyway. Why don't you check tayda for C5K pot? I am also getting high squealing like one of the posters above, does anyone know how to rectify this? I did exactly as shown on the layout. Did you ever find a solve for the high squealing? Did someone change the layout?? Ive built this and its just a low noise signal generator.. sounds like there is voltage on the signal.. I checked traces, values, jumpers, EVERYTHING! Funny thing is that i can modify the noise with all the knobs and switches like its supposed to be. When i plug out the input from my test box, the noise remains.. There has to me a major mistake somewhere!! Damn... i even triple checked everything with photoshop, marking all the components and cuts..
:( i am really frustrated! Mine sounds great, but can’t achieve even unity output, even with everything maxed out. Will post voltages late on.